A strange meteor has landed in the grass and it stood there for a few months before anyone has seen it. It was believed to harness some kind of magical powers and an evil magician was the first one to find out how to release it. It has turned the forest into a dark place where all the animals are now transformed and very aggressive. 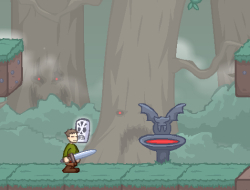 Start your quests in this adventure game and bring back the piece to the kingdom. Find new items and learn new magical spells in order to beat the evil wizard. Use the arrow keys to move and A to attack, S for magic powers and D to use items. Evil Forest 0.00 between 0 and 10 based on 0 votes.